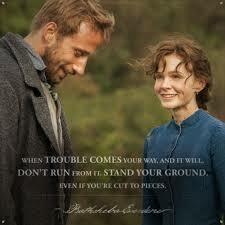 I never read the book Far From The Madding Crowd. I had no idea that this movie was based on a book. I just kind of see stuff when it comes and I watch it. There are several books that I have read, I just haven't read them all. I had never even heard of this as any type of story, so I was definitely intrigued by the cast. So going forward, if you have read this book, please understand I have not. I have no idea how closely it follows the book or how good of an adaptation it is. All I can tell you is how good of a movie it is. "Far From The Madding Crowd" is a romance story. If that is something that disinterests you then don't feel bad for bailing on this review now. This is a straight romance story. It is about a particularly crazy love triangle. Set in England during the Victorian Era, Bathsheba Everdene (Carey Mulligan) is an independent, strong farmer who receives her families inheritance, a giant farm. Bathsheba attracts the attention of three separate suitors throughout the time of her working on her family farm. One of them is Gabriel Oak (Matthias Schoenaerts), a sheep farmer who Everdene encounters several times. Another is Frank Troy (Tom Sturrage), a reckless Seargent in the English army. The last is William Boldwood (Michael Sheen), a wealthy bachelor. How these three men drift in and out of Bathsheba's life is the content of the movie. So like I said, the film is a romance movie, and if you don't like it, definitely don't see it. I take in everything with an open mind, and I liked the cast. I can also tell you that the story is not very lubby dubby. It is not sappy and it honestly is not a tear-jerker. It does not follow the same norms and cliches this genre usually does. It is driven by its characters and it tells a story about how people come in and out of our lives and how it affects us. It tells a story about how true love finds you during the most surprising and most inconsistent times in our lives. It tells us to always keep our hearts open, because the right one for us may not be the person we think at first. It tells a good story without relying on the typical norms of the genre, and for that I liked it. It also helps that the film features several great performances. I enjoyed Carey Mulligan's work and thought she did a very good job as the lead. I think Matthias Schoenaerts is one of the most underrated actors working right now, and I think that we should see more of him. I first saw him in "Rust and Bone" in 2012, a movie that is long overdue in my Overlooked Film of the Week column. He was outstanding in that and he was outstanding here. Michael Sheen is always reliable, and this is another profound performance to add to is already stellar filmography. Juno Temple also shows up in this movie, and she delivers as well. In a movie like this, the performances are the glue to the whole production and each actor throws themselves at the material they had to play. The result is more that great. If you like romance movies, you will definitely dig this. I have to say that this is more classic type of romance, but it will certainly get the job done. I can take points away from a movie that is what it is, even though romance isn't necessarily my favorite genre. This is a movie that does exactly what it set out to do, and you can't knock it for that. I will also say that the movie does what it does very well.